This post is written in collaboration with Maty’s. All opinions are mine alone. A couple years ago, I was shopping around for a vapor rub that doesn’t contain petroleum jelly. I avoid petroleum jelly in our personal care products for a variety of reasons, one of which is I don’t like the smell. To me, it smells just like petroleum and I can’t stand it. 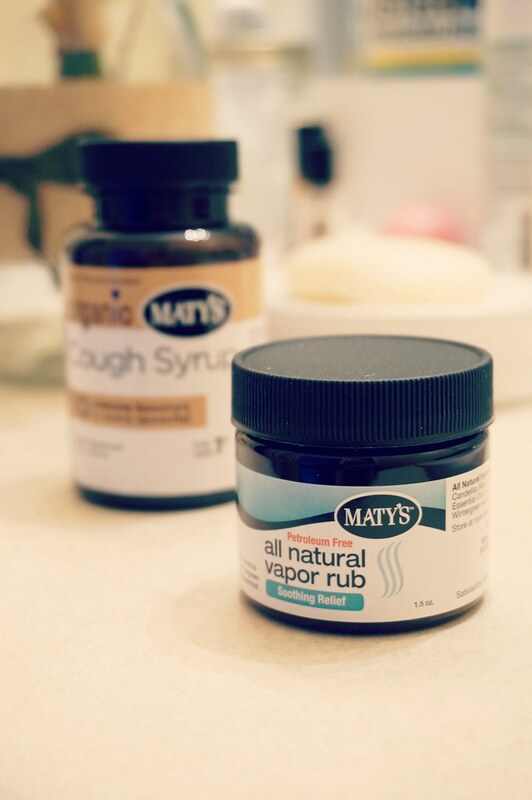 I found the Maty’s All Natural Vapor Rub at our local Harris Teeter, and our entire family was instantly hooked. We always have two containers of it at the house (one in the kids’ bathroom and one in ours). Our entire family loves the smell, and it has helped us through some pretty awful sick seasons. I wanted to share some of our sick season essentials, because it is most definitely the beginning of the cold/flu season (if this weekend was any indication!). Here are a few items that we keep around to help us through the winter cold/flu months. A humidifier is essential for us when we start to get the sniffles. I joked to Will a few years ago that I just need to buy four humidifier filters — one for November, December, January, and February. Well, we use a humidifier now that doesn’t require a filter, so yay for that! We are currently using the Vicks V4500, but they don’t make it anymore. Rest assured, whenever this one kicks the bucket (which should be a long time, they seem to last forever), we’ll be getting another filter free model. It’s so nice to not have to buy filters every month. I make our own ‘sick soak’ for when we are all feeling really cruddy. A little epsom salt, eucalyptus oil, and cedarwood oil feels so good when you are sick. This has been a staple in our medicine cabinet for a couple years. It opens up your sinuses and feels so soothing. When the kids are super congested, we also rub it on their feet before they put socks on. My husband and I use it on ourselves because this vapor rub works so well. This is a new staple in our medicine cabinet. 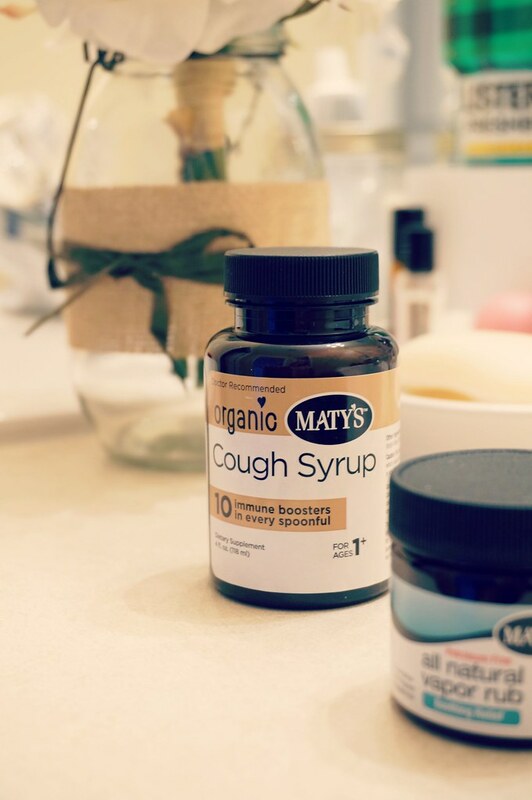 We’ve used a few natural cough syrups in the past (and even used plain honey a few times), but this one is really great. It’s quite thick, and you need a small spoon to get it out of the jar. It’s perfect for calming a congested cough because it coats your throat so well. I find that with plain honey or liquidy cough syrups don’t last very long. This one is so effective, and it contains 10 immune boosting ingredients. A couple months ago, I ordered a new oil diffuser … and immediately ordered a second. We now have three oil diffusers in our home. Two stays in the kids’ rooms and one travels between our bedroom and the living room. During the winter months, we diffuse eucalyptus and cedarwood. Those have been our go-to oils for years. Just recently, I started diffusing an oil combination that is a replication of the oils that are in the Maty’s All Natural Vapor Rub. Since we love the scent and health benefits of those oils in the rub, I figured it would be awesome in the diffuser as well! It’s like having vapor rub in the air at night. Now that we’re heading into the sick season, I’d love to hear your recommendations!